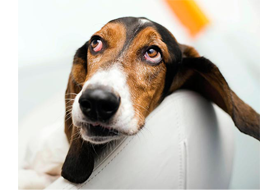 The reoccurrence of a dog’s ear infection is not surprising. In the battle for pet health, topical medications and antibiotic treatments are weapons which can help win a battle, but will most likely fail to win the war. They do not address the underlying cause, which is the existence of an environment favorable to the invaders. To win this war, we need to destroy the root of their economy, as it were, to stop creating the environment they find favorable to begin with. Adding a highly concentrated acidophilus supplement to your dog’s diet will aid in building the immune system by balancing the digestive system. Through the use of Ester C and immune boosting herbs, like astragalus, olive leaf and echinacea, ear infections and many skin eruptions can often be eliminated naturally. Finally, washes which do not disturb the natural chemistry of the ear can be used to reduce the discharge and smell. Herbs like calendula, mullein and rosemary, in a base of vinegar and essential oils, can be a helpful addition to your grooming routine. These washes are also excellent for reducing the symptoms of a current infection, cleaning the ears after swimming or just general maintenance.